Just bounds of different foods i felt like a kid in a sweets shop. Service was great food choices were great. Surroundings were very comfortable and relaxing. I love a buffet and this was a great buffet and the value awesome. A must for everyone. 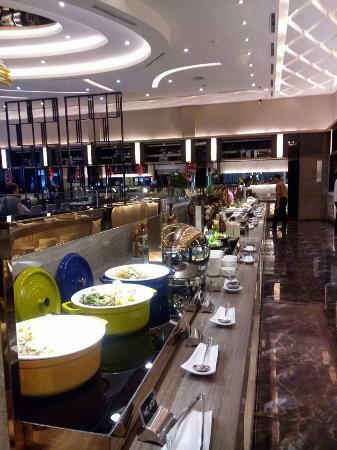 A buffet is always a good idea. Lots of food choices to choose from. My favorite will always be the steak and sushi area. Service can be a little bit slow sometimes when there are big crowds. Very unorganized and unsatisfying selection of food! The ambiance is great. The place looks so sophisticated. The food, however, tastes ordinary. There are many choices but the food isn't really that great. 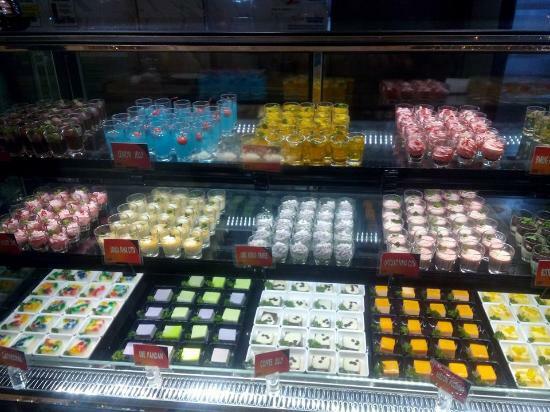 Also, their desserts are limited and there are only a few choices. The overall experience is fine and average. Get quick answers from Buffet 101 staff and past visitors. So far, they are asking for a document that shows your birthdate. birth certificate might be ok. Kindly check with them. How much is per head? 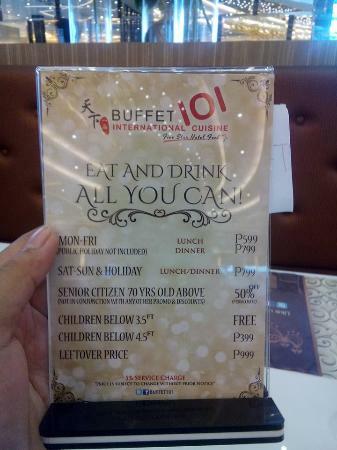 Buffet 101 Cebu Weekday lunch is P699 per head, while weekday dinner is P899 per head. 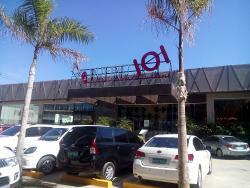 Weekends/Holiday lunch and dinner is P899 per head. Children below 3.5 feet eat for free, above that is charged P499 per head. You may wish to call them first since they may have updated their prices.